Hey Windows Insiders, it’s Adam back again from the Windows team with info about two new improvements we’ve made to Windows Search—both inspired by your feedback. If you remember from our previous Inspired By Insiders post, many Insiders had mentioned problems finding files on their PC. As Insiders pointed out, search was limited to documents, pictures, videos, and desktop folders. We responded to this feedback by expanding search to include all indexed file locations and added the option to customize which locations were indexed. 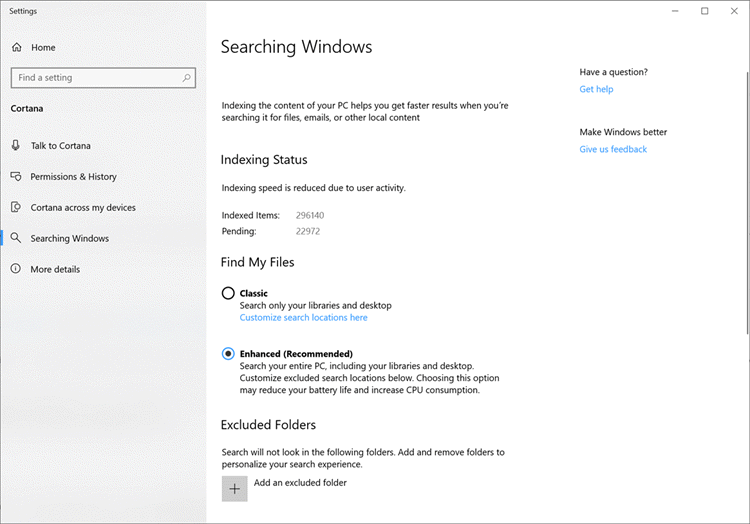 Today, driven by feedback from Insiders and Windows users, Windows Search is expanding even further. 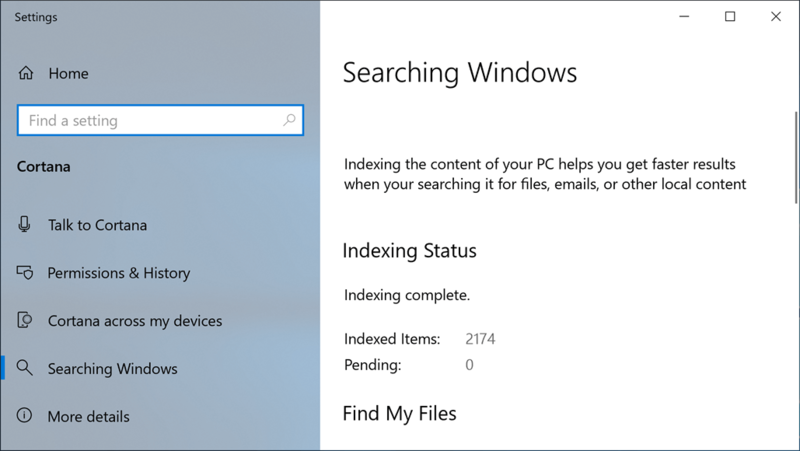 To improve our search indexing, we created a new feature called Find My Files that enables Windows to search all your folders and drives, instead of limiting search to your documents, pictures, videos, and desktop by default. This new feature is currently available exclusively for Windows Insiders to preview in Windows 10 Insider Preview Build 18267. To turn it on, search for Windows search settings, and in the Searching Windows settings, under Find My Files, select Enhanced to begin the one-time indexing process. It will take about 15 minutes for search to begin returning these additional files in results. If you have lots of files, it may take longer. Make sure you plug in before you start, indexing is a resource-intensive activity. When the indexing is complete, you’ll be able to find all your files almost instantly when you use search. 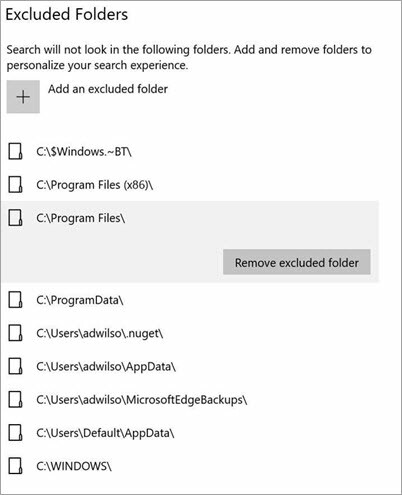 To exclude a folder from search, add it to the Excluded Folders list. To help improve performance, search excludes temporary folders and OS files, as well as folders and files that change rapidly, like program data folders. You have the option of adding and removing folders from this list to further personalize your search experience. If you update the list of excluded folders, and then switch between Enhanced>Classic>Enhanced those changes might be lost. The UI doesn’t always update right away to show that Enhanced mode is active. The Excluded Folders list will flicker during initial indexing. Indexing temporary folders and OS files—removing them from the excluded list—will slow down your system’s performance. We strongly advise against removing items from the default list. The Indexing Status updates in real time, providing detailed updates, including issues that may require attention. The pending count only includes items the indexer knows it must index at that moment. If you just added another set of files to be indexed the pending queue will grow as it discovers new folders and files. 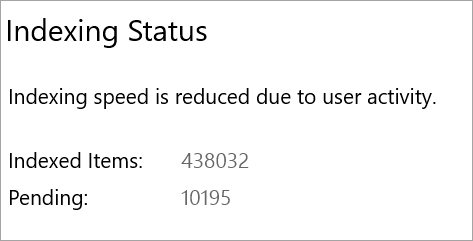 Indexing Status doesn’t include an estimate of the remaining time. If you think a timer/counter would be useful, let us know in the Feedback Hub. Readers of these search updates will notice that I haven’t covered some of the performance issues that were called out in my previous Inspired by Insiders article. We’re continuing to work on these and other issues to make performance even better, and there are a few related experiments going out soon to Insiders. These improvements rely on Insider feedback, so tell us in the Feedback Hub (Category>Cortana and Search>Find My Files) what you’d like to see next. For example, if you’d like Enhanced mode to be the default setting, let us know.